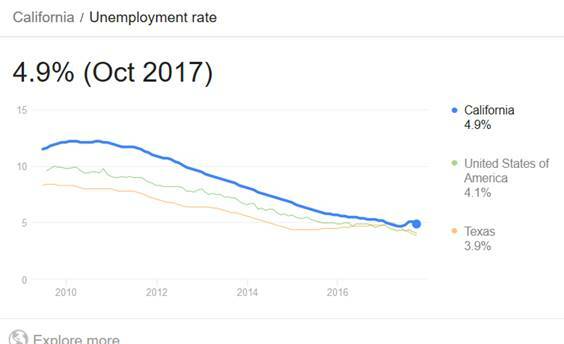 In November of 2017, the unemployment rate for Richmond residents dropped to 3.6% in November 2017, the lowest on record and possibly the lowest in history (http://www.labormarketinfo.edd.ca.gov/data/labor-force-and-unemployment-for-cities-and-census-areas.html). It is more than a full percentage point below the California rate of 4.9% and half a percentage point below the U.S. rate of 4.1%. Richmond was hit hard by the Great Recession with unemployment peaking at 18.5% in 2011.